French President Francois Hollande said Tuesday he is going through “painful moments” in his personal life after a magazine report that he is having a secret affair with an actress. 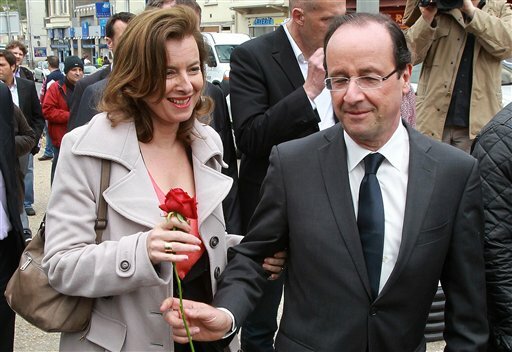 Hollande’s partner, journalist Valerie Trierweiler, has been hospitalized since Friday, when Closer published photos it said proved Hollande’s liaison with Julie Gayet. The report has heaped new pressure on the already unpopular Hollande. The latest revelations call into question whether a complex personal life can be private for someone with round-the-clock bodyguards, and about the role of “first lady” in France. Trierweiler is the first person to hold the post who was not married to the president. Hollande said he will clarify who the first lady is before he takes a presidential trip to the United States on Feb. 11, but he wouldn’t comment further. The pictures published in Closer included one of a man the magazine said was Hollande being ferried by motorcycle to an apartment where Gayet waited. Twenty years ago, the same photographer, Sebastien Valiela, rocked France’s political establishment with images that revealed the secret family of then-President Francois Mitterrand, showing the Socialist leader emerging from a restaurant with the daughter he had never acknowledged. The issue even reached the floor of parliament Tuesday. A leading legislator from the opposition conservative UMP party accused the president of taking unreasonable risks with his security. Photographer Valiela said he was surprised at the lack of security for Hollande, whose government has been repeatedly threatened by al-Qaida. Francois Rebsamen, a Socialist lawmaker who counts himself among Hollande’s friends, said the revelations showed the entire idea of a first lady was obsolete. Hollande, who has four children from a previous relationship with a leading politician, was elected as a “Monsieur Normal” in a backlash against his flamboyant predecessor Nicolas Sarkozy. Dominique Moisi, a French political analyst, said Hollande _ who was already the most unpopular president in modern French history before the recent revelations _ had brought the scrutiny on himself.